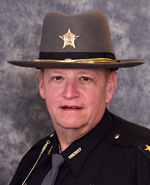 The Geauga County Sheriff's Office Auxiliary is an all-volunteer Auxiliary, the Commander is Travis Fasko. The Auxiliary is comprised of a Law Enforcement Unit, a Mounted Unit and a Civilian Unit. Each of these units has a Unit Coordinator. The purpose of these units is to aid the Sheriff's Office in areas that do not require a fully commissioned officer, allowing those officers to take care of the more urgent matters that arise. The Law Enforcement Auxiliary Unit can handle details such as traffic, security, motorcycle runs, parades, and special events such as the Geauga County Fair, etc. They sometimes work on foot or in a cruiser. Members of the Mounted Unit supply their own horse, truck, and trailer. This unit works on horseback from April through October in most cases. Each spring, all mounts must complete an annual certification. The Mounted Unit participates in many parades, security details, and works at the Geauga County Fair. The unit can also be called out to help search for missing or lost persons. The horses usually attract a great deal of attention when out, and children as well as adults always want to come and pet the horses or take pictures. Members of the Mounted Unit can also work as part of the Law Enforcement Unit at any time if the need arises. The Geauga County Sheriff's Auxiliary saves taxpayer dollars, supports law enforcement personnel, works with community organizations, and makes Geauga County a safer place to live. For more information, please contact Commander Fasko about how to join or to get more information about the Auxiliary. For information, please call (440) 279-2009, option 6.